We wound up spending Tuesday afternoon and evening wandering around Harajuku buying plastic toys and other ridiculousness (Kiddy Land toy store is a must-visit if you want to load up on Gudetama-related goodies). The rain kept coming down, meaning we just wanted somewhere nearby for dinner - luckily Brown Rice Cafe was right around the corner. Brown Rice is attached to British organic cosmetics shop Neal's Yard, and is tucked down a little laneway just to the North of Omotesando station. Like seemingly everywhere in Tokyo, it's much easier to find if you have a detailed map/functioning mobile phone. The layout is sleek and spare - wooden floorboards and tables elegantly arranged, with some nice botanical prints on the walls. There are English menus - vego restaurants in Tokyo seem to be well aware that a big chunk of their market is foreigners. The food is macrobiotic, and heavy on the veggies - you can enjoy a terrine made of 10 kinds of vegetables (1200円 ~ $13) or a mix of veggies cooked using the five principles of Japanese cooking (1300円 ~ $14.10). 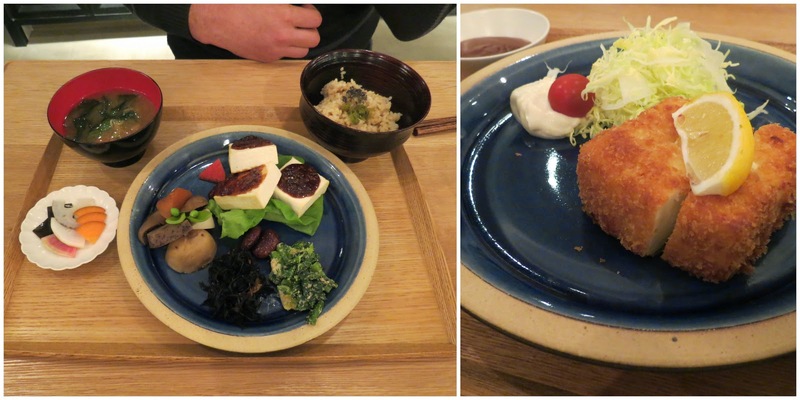 There are intriguing sounding tofu tasting plates (800円 ~ $8.70), salads and a range of other small plates. 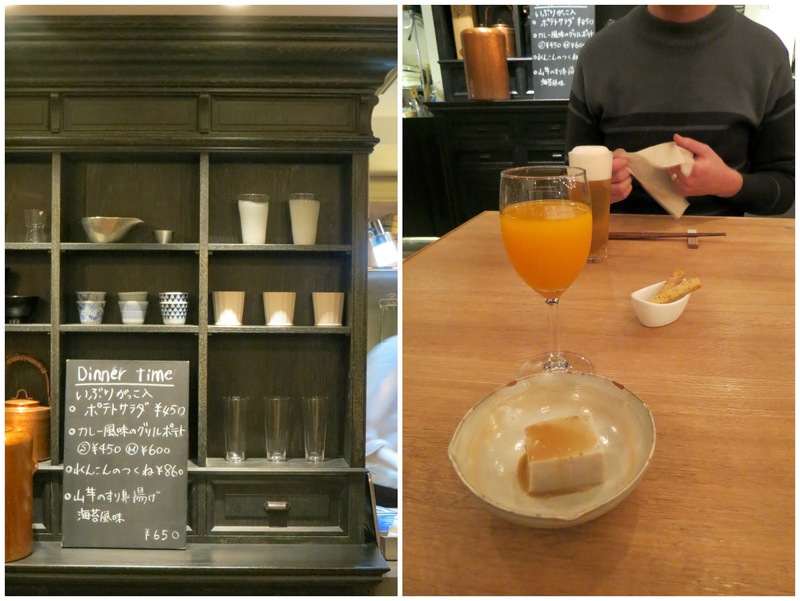 I'm not sure if it's standard or not, but this cute little square of sesame tofu and crackers came out with our drinks (beer for me and a 700円 ~ $7.50 tangerine juice for Cindy) - the tofu was smooth and the sesame flavour worked well with the light sauce it was served with. We took the easy option and ordered the brown rice dinner set - brown rice, miso soup, some sides and a choice of main for 1700円 (~$18.40) The options on our visit were steamed vegetables, Okinawa-style tofu cutlets or miso dengaku - we chose the cutlets and the dengaku and shared them. The miso dengaku was a serve of lightly grilled tofu with a strong miso sauce splotched on top, served with an impressive array of pickled vegetables and greens. It was all pretty simple, but I really enjoyed it - the seasoning on the brown rice was a surprising highlight. The Okinawa-style tofu reminded me of crumbed fish as much as anything, right down to the sweet mayo and lemon juice. We managed to leave just enough room to squeeze in a shared dessert - the tofu lemon cake with berry coulis (750円 ~ $8). This was a solid rendition of the vegan cheesecake format - they clearly know their way around tofu. We had a lovely dinner at Brown Rice. The atmosphere is a peaceful escape from the madness of Harajuku and Omotesando and the food is artfully prepared. You're probably best off ignoring the slightly mystical claims in the menu, but the mix of tofu, pickled and fresh veggies, miso soup and brown rice did feel like a healthy way to finish the day. Brown Rice Cafe has received uniformly positive reviews - see Bon Voyage Vegan, bebe & us, tokyo eats, Miss.Neverfull, universotokyo, JoJo + Japan, Vegetablian, Vegetus, Pocket Witch, Megan Mastriani, Vegan in Brighton, The Vegan Ronin, 101 Cookbooks, Sweet Potato Soul, The Expat Wife and Kittens Gone Lentil. Accessibility: There are a few steps up on entrance. The interior is spacious and there's full table service. We didn't visit the toilets.